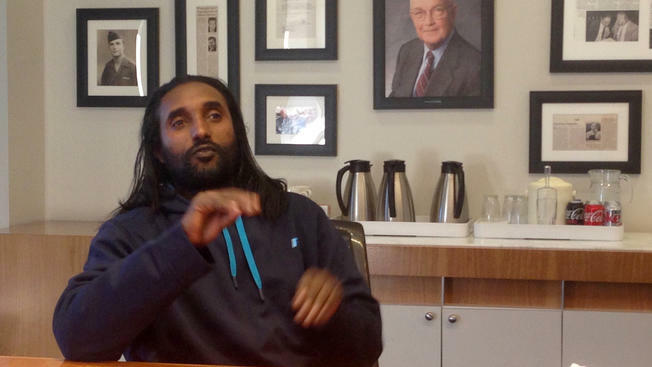 In this photo taken Feb. 27, 2015, Abreham Zemedagegehu, seated in a conference room of lawyer’s office in Washington, discusses the lawsuit he filed against the Arlington, Va., sheriff in federal court. Zemedagegehu, a U.S. citizen who was born in Ethiopia, learned that he'd been accused of stealing an iPad — an iPad whose owner later found it. He spent the next six weeks in jail, unable to communicate with his jailers because he is deaf. He described a frightening, isolated experience in which medical procedures were performed without his consent and he feared for his safety. A man whose claim about a stolen iPad left a deaf man jailed for six weeks has recanted his accusation. Abreham Zemedagegehu, a deaf homeless man, spent six weeks in the Arlington County Jail last year on charges that he stole the iPad. Last week, the accuser Robert J. Mason, who is also deaf and homeless, admitted he was mistaken as part of a legal settlement, and formally recanted his accusation. Zemedagegehu has filed a lawsuit against the Arlington County Sheriff, for failing to meet the standards of the Americans with Disabilities Act. The suit alleges that the jail failed to provide a sign-language interpreter so he could understand what was happening to hm during his incarceration. Zemedagegehu is a native of Ethiopia. He speaks Ethiopian and American Sign Language but has learned only rudimentary written English. Zemedagegehu was arrested at Reagan National Airport and said he went through the booking process and medical screening process without understanding what was happening, and even suffered a bad reaction from a tuberculosis test he said was taken without his full consent. It was not until he was arraigned Feb. 4, and a court interpreter was present, that he understood the charge against him, he said. On March 14, 2014, Zemedagegehu struck a plea deal, pleading guilty to lesser misdemeanor charges in exchange for time served. Zemedagegehu said he only took the deal to get of jail, and that he didn't steal the iPad. Mason later found the iPad.